UV Germicidal Solutions are critical to prevent contaminants developing within HVAC systems. New air handling units are installed without the presence of pathogens like bacteria, viruses and mold. 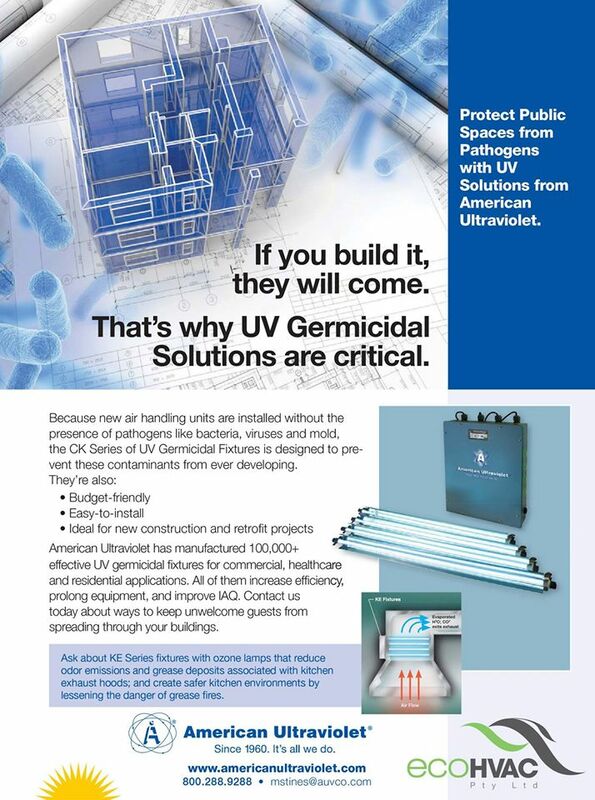 The CK series of UV germicidal fixtures is designed to prevent these contaminants from ever developing. They are also budget friendly, easy to install and suit either new constructions or retrofit projects. For further information, please visit our HVAC UVC Germicidal Light page or visit our Contact Us page. ecoHVAC is excited to announce their appointment as a representative of HVAC ultraviolet light equipment with American Ultraviolet® for Australia & New Zealand territory. Since 1960 American Ultraviolet® has manufactured close to 60,000 effective UVC germicidal fixtures for healthcare, commercial, and residential applications, including HVAC, hospital, pharmaceutical, laboratory, food and beverage manufacturing and processing, among others. Their UV germicidal products can be used in the air, in liquids and on surfaces to increase efficiency. With health insurance no longer covering healthcare associated infections (hospital acquired infections), hospitals can avoid significant monetary waste by investing in proven UVC technology that plays an important role in reducing infections. For further information, please vist www.ecohvac.com.au and/or contact ecoHVAC Pty Ltd on 07 3808 9400.